Docking at the port of Marmaris, you will be met by your private guide and drive on to Dalyan. Covering some of the most beautiful and fecund fields in Southwest Turkey, you will reach the village of Dalyan from where you will take your private wooden boat named “taka” and will have an adorable cruise on the waters of Koycegiz Lake. The first place you will visit is the sulphur baths that are known as the Baths of Cleopatra. The tradition states that even the great Queen of Egypt bathed here to make her skin look more attractive. Continue your cruise on the waters of Koycegiz Lake and reach the famed beach at the mouth of the lake opening on to the Aegean Sea, where Caretta Caretta turtles come to lay their eggs once every year. You can enjoy cold refreshments at a cafe on this beach enjoying the beautiful scenery of the Aegean Sea. Returning back to your boat, you will cruise on to ancient Caunos that was known for piracy in the antiquity. 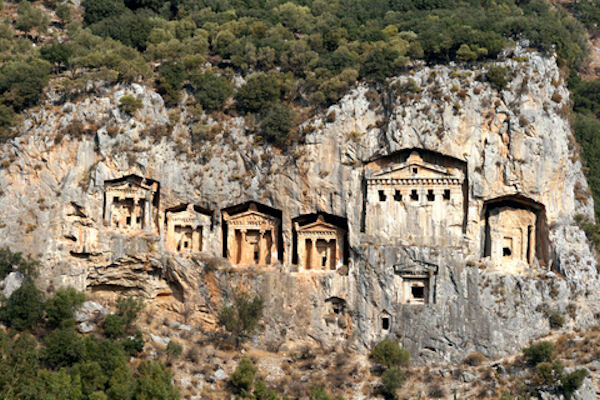 The rock carved tombs of the Lycian Kings, which date back to 4th century BC, will be another scenic asset to your day. After touring the ruins of Caunos, you will return again by your boat to Dalyan where you will board your vehicle to lead your way back to Marmaris to continue your cruise ship. Please be sure to wear comfortable walking shoes and don't forget your camera. Minimum of 2 passengers required.